The Miraculous Medal is the most popular religious medal in the world, and for good reason: it comes from Heaven. Catholic Shop offers thousands of Gold Miraculous Medals below. For other varieties, see all of our Miraculous Medals. Why everyone should wear one: The Miraculous Medal originated in the year 1830 after St. Catherine Labouré experienced an apparition of the Virgin Mary at a convent in Paris, France. "God wishes to charge you with a mission," Our Lady said to Catherine. Catherine reported that Mary came framed in an oval and standing upon a globe. Rays of light shone from her hands. Around the edge of the oval, these words appeared: O Mary, conceived without sin, pray for us who have recourse to thee. Our Lady asked Catherine to have the image made into medallions and distributed, saying "All who wear them will receive great graces." Learn more in this article by the founder of Catholic Shop: 20 Things I Didn't Know About The Miraculous Medal. 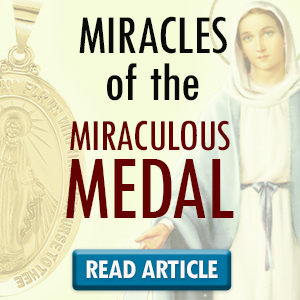 Browse our many categories of Miraculous Medals below. All orders over $40 ship free, and every package is insured free. This 14K gold Miraculous Medal available from CatholicShop.com features dimensions of 29 X 20.5 millimeters, approximately 1 and 1/4 inch by 4/5 inch. The larger size makes it ideal for men, or women who prefer a larger religious medal. Made of 14K Yellow Gold, the Miraculous Medal shown here weighs approximately 2.49 grams. The core of the medal is hollow, making it an affordable but still very durable choice for a 14K medal. It comes ready to give as a gift in a free deluxe gift box. SALE! This 14K gold Miraculous Medal available from CatholicShop.com features dimensions of 19 X 13.5 millimeters, approximately 3/4 inch by 1/2 inch. The medium size makes it ideal for women. Made of 14K Yellow Gold, our medium hollow Miraculous Medal shown here weighs approximately 1.42 grams. The core of the medal is hollow, making it an affordable but still very durable choice for a 14K medal. It comes ready to give as a gift in a free deluxe gift box. SALE! This 14K gold Miraculous Medal available from CatholicShop.com features dimensions of 15 X 12 millimeters, approximately 2/3 inch by 1/2 inch. The small size makes it ideal for women and children. Made of 14K Yellow Gold, our small Miraculous Medal shown here weighs approximately 0.93 grams. The core of the medal is hollow, making it an affordable but still very durable choice for a 14K medal. It comes ready to give as a gift in a free deluxe gift box. This Miraculous Medal available from CatholicShop.com features dimensions of 14.75x11 millimeters, approximately 5/8-inch by 3/8-inch. It's small to medium size makes it ideal for women and children. Made of 14K Yellow Gold, this religious jewelry piece weighs approximately 0.98 grams. It comes ready to give as a gift in a free deluxe gift box. This Charm Size Miraculous Medal available from CatholicShop.com features dimensions of 12 X 8 millimeters, approximately 1/2-inch by 3/8-inch. Made of 14K Yellow Gold, this religious jewelry piece weighs approximately 0.64 grams. It comes ready to give as a gift in a free deluxe gift box. These 14kt Yellow Gold Miraculous Dangle Earrings features medals that measures 12 mm by 9, or 1/2 inch by 3/8 inch. They usually ship the same business day if order by 6 PM EST. SAVE 39%! This 14KT Gold Miraculous Medal 4-Way Cross Pendant available from CatholicShop.com features dimensions of 35 X 28 millimeters, approximately 1.38-inches by 1.1-inches. It's a beautiful piece of Catholic jewelry, featuring five holy medals in one! Made of 14K Yellow Gold, this religious jewelry piece weighs approximately 4.11 grams. It comes ready to give as a gift in a free deluxe gift box. In addition to the main Miraculous Medal which features Our Lady, the other medals are the Sacred Heart of Jesus (top), Scapular medal with Our Lady of Mt. Carmel (bottom), St. Christopher (right), and St. Joseph (left). >This medal does not come with a chain, but it does come with an attached bale to fit any chain. See our 14K gold chains. This Miraculous Medal available from CatholicShop.com features dimensions of 22 millimeters, approximately 7/8-inch round. Made of 14K Yellow Gold, this religious jewelry piece weighs approximately 3.5 grams. It comes ready to give as a gift in a free deluxe gift box. This petite Miraculous Medal measures 12 millimeters, approximately 1/2-inch round. Ideal for children or women who prefer small medals. Made of 14K Yellow Gold, this piece features a weight of 0.78 grams. It comes ready for gift-giving in a complimentary jewelry box. 14K Yellow Gold Miraculous Medal - SALE! ON SALE! This Miraculous Medal available from CatholicShop.com features dimensions of 29 X 20 millimeters, approximately 1 1/4-inches by 3/4-inch. Made of 14K Yellow Gold, this religious jewelry piece weighs approximately 6.13 grams. It comes ready to give as a gift in a free deluxe gift box. SALE! This 14K gold Miraculous Medal available from CatholicShop.com features dimensions of 23 X 16 millimeters, approximately 4/5 inch by 3/4 inch. The standard size makes it ideal for women. Made of 14K Yellow Gold, the Miraculous Medal shown here weighs approximately 2.33 grams. The core of the medal is hollow, making it an affordable but still very durable choice for a 14K medal. It comes ready to give as a gift in a free deluxe gift box.